Wear your finest 1920’s glad rags and join us for great food, drink and live music by the Pentucket Jazz Quartet! So come out and “cut a rug”! Tickets are $50 each and include hearty appetizers, live entertainment and a cash bar. 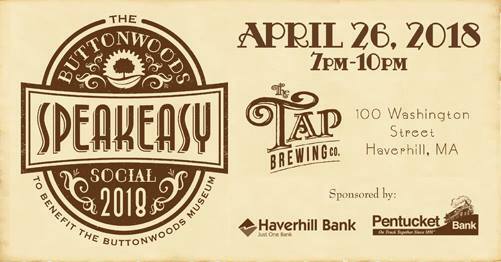 Sample a unique ale made by The Tap especially for the Buttonwoods Museum! All net proceeds benefit the Buttonwoods Museum to help maintain the museum properties, protect priceless artifacts of Greater Haverhill’s history and fund educational programs for all ages. Sponsored by Haverhill Bank, Pentucket Bank and the Buttonwoods Museum.